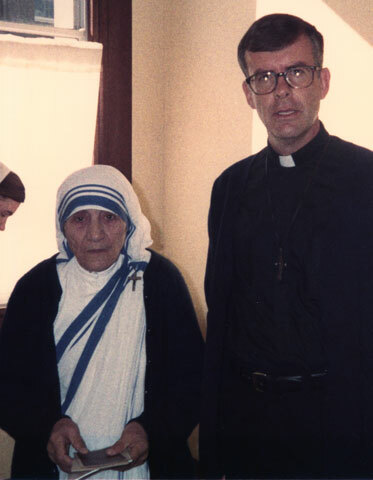 Standing at a scant 5 feet, Mother Teresa stepped out onto Sisters of Charity’s fourth-floor roof that overlooks the busy streets of Calcutta to greet Jesuit Father Bob Fabing. She bowed and he bowed, and then they sat and spoke of their charisms, his with family counseling, and hers with the impoverished. When Father Fabing first glimpsed Mother Teresa in 1983 he had no inkling the meeting would be the start of a decades-long friendship. These meetings are ultimately what inspired him to write the Mass for Teresa of Calcutta: A Mass for the poor, which he first shared when Mother Teresa was visiting San Francisco to open a hospice to serve those dying during the AIDS epidemic. When Blessed Mother Teresa is canonized Sept. 4 in Rome, Father Bob Fabing will be there, leading the music at the Mass in her honor. People all over the world will join together to sing the direct and welcoming Mass that captures her spirit. Pope Francis has asked to meet with Father Fabing before the canonization in September. The priest said the canonization Masses will be the pinnacle of his musical life. But, the Mass isn’t just for Mother Teresa, Father Fabing said. “I wrote the Mass for the dying AIDS patients, for the people who live under the freeway in San Francisco, for the prostitutes lining the streets, for the Sisters who go and give them sandwiches, hot coffee and medals of the Sacred Heart,” he said. These were the people who filled the pews to sing Father Fabing’s Mass the first time. Today the Mass for Teresa of Calcutta is sung in Missionaries of Charity convents everywhere, including Afghanistan, Rome, Brazil, the Philippines. To honor Mother Teresa on the occasion of her canonization, OCP has compiled Father Fabing’s Mass for Mother Teresa of Calcutta with other songs inspired by her selfless acts. To honor Mother Teresa on the occasion of her canonization, OCP has compiled an MP3 album with Father Fabing’s Mass for Teresa of Calcutta and other songs inspired by her selfless acts. A gifted composer, Father Bob Fabing, SJ, has published a number of collections of liturgical music and is the founder of the Jesuit Institute for Family Life Network, a worldwide network of marriage counseling and family therapy centers. Through more than 70 meetings with Mother Teresa, Father Fabing captured her spirit with the Mass for Teresa of Calcutta.